Gilbert: Did you ever see a beached whale on television? That's her. That's my mom. Becky: What about your dad? Gilbert: Some other day. Some other day. 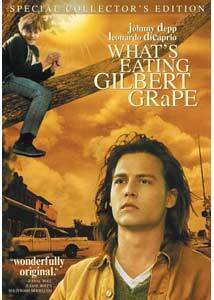 Gilbert Grape (Johnny Depp) is trapped in the small town of Endora, Iowa. Trapped by his obligations to his mentally impaired younger brother Arnie (Leonardo DiCaprio), by his mindless job as a stock boy at the local grocer, by his awkward affair with a local mother (Mary Steenburgen), but most of all, by his mother, a once-beautiful woman who is likewise trapped�she weighs 500 pounds, and hasn't left the house in seven years. Depp has always gravitated towards oddball characters (he's a favorite of director Tim Burton, an oddball in his own right), and Gilbert is similarly alienated from his surroundings. He's fiercely protective of Arnie, but resents his role, and tires of constantly bailing him out of trouble (Arnie has a tendency to climb the town water-tower whenever no one is looking). Of course, he's not alone�Endora is populated with a variety of small-town weirdoes. Gilbert's best friends Tucker (John C. Reilly) and Bobby (the always slightly-off Crispin Glover) have their own peculiarities. Tucker's goal in life is to become manager at the newly opened Burger Barn, and Bobby is an under-worked undertaker always on the lookout for a new client ("I haven't seen your mother in a while, how is she doing?" he asks a neighbor hopefully). But Gilbert is the only one who seems unfulfilled with life. Everything changes, as things often do, when a stranger rolls into town. This time, it is Becky (Lewis) a young woman as idealistic as Gilbert is cynical, and she and Gilbert begin a timid romance. She opens his eyes to the world around him, disrupts a routine that might have gone on for years. It's not a monumental change, or an easy solution to Gilbert's problems. But she sees the simple beauty of Gilbert's life, and of his brother Arnie. Gilbert, so long asleep, finally awakens to meet his present and contemplate a future he didn't think he had. Johnny Depp is a fine actor, and he's perfect for Gilbert. He hits just the right notes of gentleness and angst. Leonardo DiCaprio, in a performance that deserved to earn him the fame that Titanic eventually did, gives the most convincing performance as a mentally impaired person since Dustin Hoffman in Rain Man. He never goes for the obvious�a loveable, clich�d "dunce with a heart of gold." Arnie is equally endearing and exasperating, and it's clear why Gilbert is so devoted to him (and why he drives everyone so crazy). The real standout, though, is newcomer Darlene Cates as Gilbert's mom. She manages to inject humanity into a role that could've been one-note. Yes, she's fat, but she's also human, more than a simple freak show, and once again we see both why she is so difficult for Gilbert to live with and why he sticks around. Swedish filmmaker Lasse Hallstr�m has gained notoriety in America for his annual Miramax best-picture bid (The Cider House Rules, Chocolat), and his craft is on display in this picture as well, which is closer in spirit to his best film, the melancholy My Life as a Dog. He balances the routine, the dramatic, and the bleakly comic without faltering. Peter Hedges, adapting from his own novel, has crafted an elegant slice-of-life screenplay, one without a traditional, forced narrative. At the end, nothing has changed and everything has, and we've done little more than spend a few hours getting to know a unique cast of characters. Less a standard film, and more a series of poignant vignettes on the allure and frustration of small town life, What's Eating Gilbert Grape is touching character piece that deserves to be seen. Image Transfer Review: Gilbert features excellent use of color, and the look transfers well to DVD, with rich, saturated earth tones. Black level is excellent, though shadow detail is a bit weaker than I'd like in a few scenes. Digital artifacting and edge enhancement are non-existent. Film grain is likewise not a problem. The print used is in excellent condition, with only a few minor scratches noticeable. Audio Transfer Review: Gilbert has been granted an unnecessary 5.1 remix, but the results are quite nice. This is dialogue driven film, and thus, the front soundstage handles most of the audio. Dialogue is always clear and well mixed. The front soundstage is wide enough, as things never sound constricted, and it handles what few sound effects there are quite well, and with good directionality. The score makes good use of the front mains, and does creep into the surrounds a bit as well. Extras Review: What�s Eating Gilbert Grape isn�t the kind of film that screams out for supplements, but I�m glad Paramount decided to replace the original, barebones DVD with this special edition. There aren�t a lot of extras, but what�s included offers some nice reflection from the cast and crew. The Voice of Gilbert Grape (5m:30s) reveals that Depp signed on to the film without reading a script, based solely on the strength of the book and the fact that Hallstr�m was directing. Hedges, meanwhile, discusses the challenges he faced adapting his own novel. Why We Love Gilbert Grape (7m:47s) is, if the title didn�t tip you off, an unashamed outpouring of affection for the movie from the cast, writer, and director, who all share their favorite parts of the process. Hallstr�m loved working with director of photography Sven Nykvist, who shot a lot of Bergman films. Darlene Cates talks about how Momma�s life related to her own, and others discuss favorite scenes. It�s puffery, but worth watching if you connect to the movie on an emotional level. The disc also includes a trailer and a brief photo gallery. The back of the box lists the running time as 128 minutes, but that�s just a mistake�the movie is still just 118 minutes long. It�s divided into 17 chapters and includes English subtitles. A warm and whistful small-town drama, What's Eating Gilbert Grape is Swedish director Lasse Hallstr�m's best American film. It finally gets its due with this special edition DVD, with top drawer video and audio transfers and some thoughtful supplements.